Hmmm... keeping it 100, whilst I am looking forward to seeing the final product I can't help but to feel that on 1st impression, production values in the trailer are a slight fall from grace when placed side by side against its studio backed big brother 'Noahs Arc Jumping The Broom'. Still, Polk's strength as a writer / producer as seen in Punks and earlier episodes of the 1st season of Noah's Arc, is that once the characters win you over, the polished finish that we as consumers take for granted become less of a priority and you come away instead, appreciating the labour of love that is the end product. I watched the trailer about three times and true to the above, the movie becomes more and more eagerly anticipated. 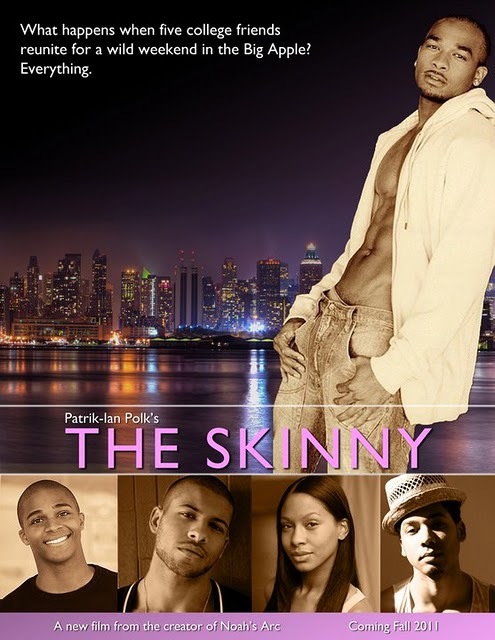 The Skinny is scheduled for a limited US Labor Day weekend release at selected cinemas. Will you be going out to support?